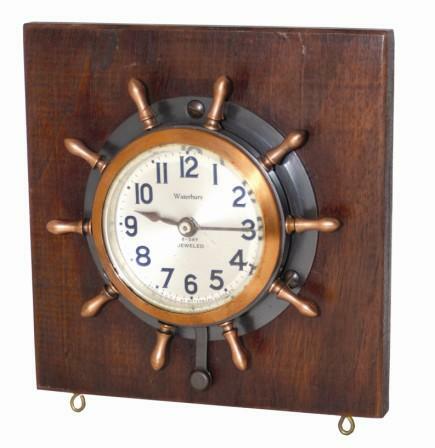 Waterbury Clock Co. ships clock, "Motor Boat", ca 1929. Made for use on boats or on land and can be fitted to almost anything. This clock is fitted to a mahogany box. I am not sure how the box was used although it will sit flat. Fitted with an 8 day jeweled movement of the non striking type, and have a 2.5" silvered metal dial. The clock is wound and the hands set, by turning the pilot wheel, which is the bezel for the clock The box is 6" square, the diameter of the spokes is 5". Ly-Waterbury, page 533.